PENTIRE (GB) (Bay 1992-Stud 1997). 8 wins, Ascot King George VI & Queen Elizabeth Diamond S., Gr.1. Champion NZ Sire (AEI) 2005-06. Sire of 1050 rnrs, 667 wnrs, 45 SW, inc. Xcellent (New Zealand Derby, Gr.1), (King) Mufhasa, Zarita, Rangirangdoo, Pantani, Xtravagant, Say No More, Prince of Penzance, Art Success, Recurring, Pentane, Penny Gem, Ferlax, Markus Maximus, Pentathon, Tinseltown, Pentastic, Zanna, Kincaple, Larry's Never Late, Amexed, etc. DECORAH (f. by Pins). 7 wins-1 at 2-from 1200m to 2400m, NZ$312,835, to 2015-16, ARC City of Auckland Cup, Gr.3, Manawatu Breeders' S., Gr.3, Waikato RC Crombie Lockwood 2YO H., ARC Barfoot & Thompson Twilight Cup, Edge Workdays With Megan Mile H., Counties RC NRM H., Rotorua RC Firth Certified Concrete H., 2d WRC Trentham S., Gr.3, ARC Active Electrical Suppliers Mile H., Taranaki RC New Zealand Bloodstock Insurance Oaks Prelude H., 3d Cambridge JC Travis S., Gr.2, Waikato Gold Cup, Gr.3-twice, Rotorua Cup, Gr.3, ARC Karaka Stayers Cup, Carbine Club Trophy H., Waikato RC Loch Haven Thoroughbreds H., 4th ARC Sunline Vase, Gr.3. The Mighty Jrod (g. by Pentire). Winner. See below. Nordic Dancer (Generous). 3 wins. See above. Good Samaritan. 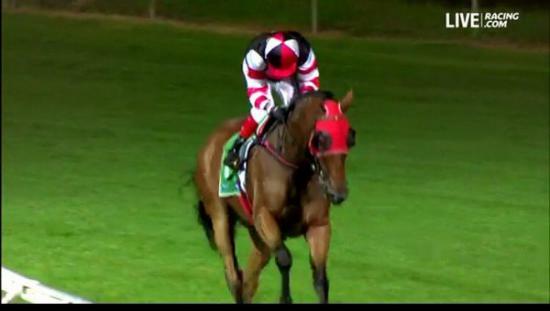 5 wins from 2000m to 2200m, A$128,920, AJC Sandringham H., Cabra-Vale Diggers Golf Club H., 2d AJC Ma Chiquita H., Bigpond Music H., Pharaoh H., 3d AJC Sydney.com H.
ROUGH HABIT (Roughcast). Horse of the Year in NZ in 1991-92 & 1994-95. Champion Older Male in NZ in 1994-95 (2000+). 29 wins from 1200m to 2400m, NZ$347,575, A$3,445,250, AJC Queen Elizabeth Randwick S., Gr.1, All-Aged S., Gr.1-twice, Queensland Derby, Gr.1, BATC Doomben Cup, Gr.1-3 times, QTC Stradbroke H., Gr.1-twice, VATC Caulfield S., Gr.1, WRC Captain Cook S., Gr.1, QTC PJ O'Shea S., Gr.2, Taranaki S., Gr.2-twice, Otaki Maori RC WFA S., Gr.2, 2d MVRC WS Cox P., Gr.1, STC BMW S., Gr.1, VRC LKS Mackinnon S., Gr.1, BATC Doomben Ten Thousand H., Gr.1, STC Ranvet S., Gr.1, 3d STC BMW S., Gr.1, AJC George Main S., Gr.1, Queen Elizabeth Randwick S., Gr.1, BATC Doomben Cup, Gr.1, Waikato RC Lion Brown Sprint, Gr.1. CITI HABIT (Citidancer). 6 wins from 1200m to 2000m, NZ$67,050, A$216,450, BTC Chairman's H., Gr.3, Marton JC Metric Mile, Gr.3, WRC Combined Rotary Clubs H., Cambridge JC Training Complex H., 2d QTC Brisbane Cup, Gr.1, PJ O'Shea S., Gr.2, Hawke's Bay Te Runga 3YO H., ARC Ford Mondeo H., BTC Chandon Estates H., 3d QTC City Motor Auction Group H. Sire. I Gotta Feeling (His Royal Highness). 7 wins from 1600m to 2100m, Taranaki RC Hassall Homes H., 3d Hawke's Bay Lowland S., Gr.3, ARC Auckland Co-Op Taxis H., Waikato RC Lammermoor Farm Duke of Gloucester Cup, WRC Trentham Gardens 2YO H., Taranaki RC Nicci Goodin Designer Florist H.
ADDICTIVE HABIT (Colombia). 11 wins-1 at 2-from 1200m to 2050m, NZ$702,137, A$70,500, to 2015-16, Hawke's Bay Livamol Classic, Gr.1, CJC Coupland's Bakeries Mile, Gr.2-twice, Waikato RC Foxbridge P., Gr.2, Qld Tatt's RC Southbank Insurance Brokers H., L, ARC Scot Thrust H., Hawke's Bay Stella Artois Mile H., Livamol Classic H., Waikato RC Ada Parnwell QSM Tribute H., ARC GL Cooksley Tankard H., 2d ARC Great Northern Guineas, Gr.2, Championship S., Gr.2, Levin RC Ryder S., L, Taumarunui Gold Cup, L, Te Aroha JC Pyramid Trucking H., Waikato RC Dundeel H., 3d SCTC Troy Trevitt Homes H., Wanganui JC Foxton Cup, 4th Hawke's Bay Makfi Challenge S., Gr.1. BRANSON (Personal Flag). 7 wins from 1600m to 2100m, NZ$103,963, A$8,000, Canterbury Gold Cup, Gr.3, CJC Spring Classic H., L, Steam Tug Lyttelton H., Avondale JC Glenn Wells H., Rotorua RC Gourlay Homes H., 2d MVRC Carlton Draught H., Greymouth Cup, ARC Thoroughbred Sports Bar H., 4th CJC Easter Cup, Gr.3, ARC Trident Tavern Classic, L.
Race Record: 12 Starts 1-1-1 A$26,415. Winner at 2050m in 2015-16, 4th Geelong Classic, L.